SpeedSport Promotions : New Website for The Speedsport Gallery!! New Website for The Speedsport Gallery!! More unique and exciting items will be added over the next few weeks so please keep having a look and get in touch if you wish to view anything. We are always open between 9.00a.m. and 5.00p.m. Monday to Friday and at weekends and other times by appointment. 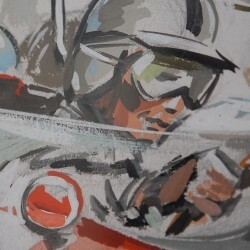 The picture shows a wonderful detail from our original painting by H Cauy of Willy Mairesse's sharknose Ferrari which we currently have for sale.